The Sierra Madre Tattler! : Unanswered Measure UUT Question: Why Does Sierra Madre Pay Such High Employee Health Plan Benefits? Unanswered Measure UUT Question: Why Does Sierra Madre Pay Such High Employee Health Plan Benefits? 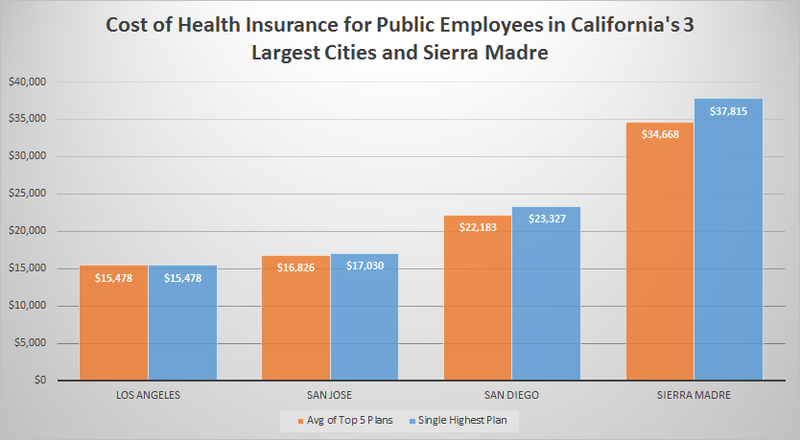 A few weeks back we asked why Sierra Madre's City Hall is paying some of the highest employee health plan benefit costs of any city in California. No answers were forthcoming, so I guess we'll just have to keep asking. The theory that has evolved among those who post comments here on this site is pretty cut and dried. If the City has the money they'll spend it. Sierra Madre residents pay the highest utility taxes in the State of California (link), and since that cash is readily available to City Hall, they've been spreading it around to the help. And, since they are apparently well-funded enough to do it, in ridiculously high amounts. You need to ask yourself this. Do you have a $37,815 per year health care plan? Anybody set you up with one of those lately? Sierra Madre's water superintendent does, and as far as I can tell (believe me, I have checked), that individual has the single highest costing health care plan in the state. Maybe we should ask him for autographs. He truly is one of a kind. But our health plan rich water superintendent is not that far ahead of some of his fellow city employees. All of which goes to show, if you give City Hall the money, they will find ways to spend it. And in the case of employee health benefit plans, the sky is apparently the limit. Despite all of their cries of poverty and the need for more tax money. Here is a chart that was prepared for us by Transparent California.com. The health plan amounts highlighted are among the highest in California. Transparent California also put together the following graphic to highlight just how out of line Sierra Madre is on the costs of the health plans City Hall buys. Even Los Angeles, which is in the throes of one of the worst financial crises in a history notable for such things, is far behind our little town. We are today in a class all of our own. If the current UUT is allowed to sunset, there’s no other meaningful source of revenue to replace what’s lost. We’ll have to do one of the following: Cut 13% across the board, make selective cuts that total $1,000,000 annually, or outsource one or more departments. With our employee health care plans as immense and out of line with what other cities are paying as they are, it would seem to me that there are still plenty of places to cut without in any way harming public safety services. Just bringing the city's health plan costs into line with what other cities are paying would save a hundred thousand dollars a year, and probably more. What Councilmember Capoccia is saying about "across the board cuts" might not be exactly true. There apparently is a protected class of spending at City Hall that is not to be touched, or even discussed, no matter how long your articles on the topic might be. The widely held perception is that Measure UUT is all about continuing to raise the money necessary to fund the pensions and expensive benefit packages that our municipal employee unions are demanding. Including the Police Officers Association. I agree with that. And Capoccia, along with three other members of the City Council, want to give these people whatever they want, and with little effective consideration of the costs to the taxpayers. I assume because that is being viewed there as the easier option. At least it has been the easier option up until now. 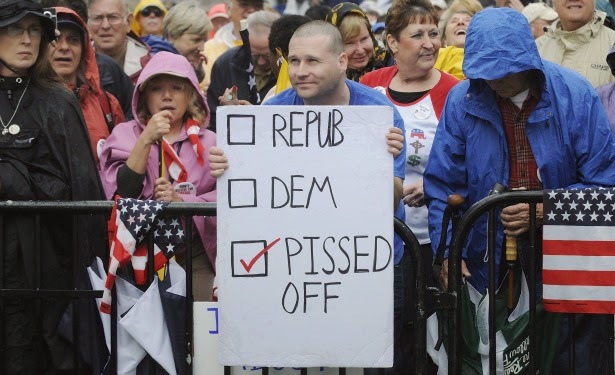 The people who actually pay for this mess get their say on April 8th. Chances are now looking pretty good that they will "re-defeat" the 10% UUT, and for the second time in two years. It is always easier to spend other peoples' money. At least until they decide they've had enough and take it away. Good for them, it's refreshing to see people being taken care of for a change. ..yes on UUT! You are obviously a bit of a chump. I would like to be able to take care of myself and my family but with all the rising taxes I find I have less and less for me and my family. Yeah, taken care of like the way Robert Rizzo took care of his friends in the city of Bell. Thanks but no thanks. Put these dirt bags in jail! I struggle to take care of my own. I certainly want to vote Yes now, can we bump up the salaries and perks? Our PD certainly deserves it with all the crime fighting and gang problems -writing traffic citations is hard work. I don't know why we should stop with state records for utility taxes and health care perks. Can't we go for national records as well? What is included in this "healthcare" spending ???? Spa days and daily massage? Why is it so expensive ? Stretch ambulances. Medivac evacuation with three helicopter security detail. How can anyone vote them selves more taxes after reading all this info. We were No Voters on UUT from the beginning, thanks for showing us we were right. The two candidates voting yes are only doing what they are told. I'm voiting NO NO NO on U U T.
laughable that our PD commander makes 100K for this city. The city manager pay could easily be cut by 20-30% and we could hire a manager that is at the end of his or her career instead of trying to make bank $$$ at our expense. Librarian sure gets paid alot for one small branch - we should take the YES crowd on their collective word that the libarary is a unneccessary expense and align with Pasadena. The Tattler is correct that it is the nature of government to expand to meet the revenues given to it. It doesn't matter how much money you feed it, it will never be enough. Taxpayers give the city money, the present UUT spells exactly what the terms are and how long its going to last, and because the government expanded in all sorts of ways other than what the tax was originallly supposed to be for, you then have another "emergency" if you don't increase and extend the tax. The tax proponents try to position is so that the only things available to cut are the paramedics, police, fire and other community services. Once again, its the same game in every town. They create the artificial emergency and always expect the taxpayers to bail them out. Some of the city council candidates talk about the "hard choices" that will have to be made if the UUT is not passed. But isn't that their job to make the hard choices. Residents of Sierra Madre make the hard choices every day with their own budgets The problem is that each city council avoids the hard choices and kicks every can down the road for the next council to deal with. During their tenure in office, people like John Capiccia , want to avoid the "hard choices". They get into office, get cozy with the public employee unions and turn into fundraisers for the unions at the taxapayer's expense. Our city government will only live within its means when it is forced to do so. Finally, another reason why taxes go up and up is because those narrow interest groups like the public employee unions stand to get access to millions of dollars in taxpayer dollars when taxes like the UUT are passed while each individual taxpayer's bill only goes up a smaller amount. That's why the unions are willing to fight so hard for these tax increases and why they often win. The naarrow group of beneficiaries of the tax increase are simply much more motivated. Its hard for taxpayers to be as motivated unless they focus on the cumulative effect of all the tax increases like the water rates. Only then, can taxpayer's muster the motivation necessary to defeat the constant barrage of new taxes. Amen 6:38! In talking with folks about the UUT vote, I actually poke to one or two who thought that if we give the city this increase they will save it up for the future when they need it. It was difficult not to laugh. Can anyone give me an example of a time when government saved up for that proverbial "rainy day"? No, if the unions know that money is available, they will demand a large chunk of it. and it is a shame thatMr. Capoccia now works for the city and not the citizen. we pay a fire chief - thought he was a volunteer? No. 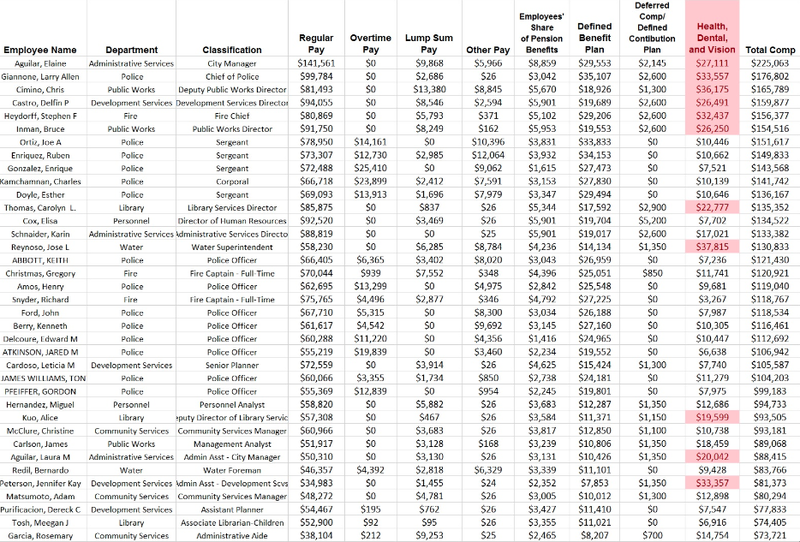 Top management at the SMFD is paid like any other city employee. The 'volunteers' at the FD are also paid when they go out so it's not a free service. On a side note...I am a neighbor of John C and the cops are ALWAYS stopping by to chat with him..he has been in bed with their union before he was elected. Outsource the PD and FD! I also wouldn't cry if the library was closed. Have lived in SM for 25 years and have never set foot in that place. If they did a survey to see how many actually use the library and divided that number by the cost of keeping it open it would be interesting to see how much money per user we are wasting. Yes, and the fire chief stated at the last council meeting that only 3 of the volunteer fire fighters live in town. You don't use our library, but about 300 other people use it per day, plus there are several programs that are offered through the schools. As the saying goes, the library is more than just books. I voted no on the UUT but I believe the library doesn't have to suffer, nor any other program unless the City Manager wants to punish the citizens for not giving her more money. I agree. Save things like the Library and PD, cut out the crazy spending on things like benefits for staff. That we could be losing important things like that because some dude has a $37,000 health plan infuriates me. Measure UUT is about benefits and pensions. City Hall would throw the library under the bus to protect their money. The score on Nancy Walsh's street. 8 No signs, 1 Yes. Nancy has been known to get grumpy with the neighbors sometimes. Hubris doesn't always equal effectiveness, 8:47.
nancy's support for something is usually a guarantee that people will be against it. the worst thing that ever happened to the "yes uut" campaign was nancy leading it. I think the best thing for the residents is that Nancy Walsh is the head of Yes on Higher Taxes. Maybe Susan Henderson wasn't available. order up your NO on UUT sign today. Just let the Mod know you want one. Yes signs seem to do best at houses with no residents and city owned meridians. No signs predominate at places where actual taxpayers live. I saw a lady taking down Burton L. Brink political signs and throwing them into her trunk in between Ralphs and Rite Aid this morning in Arcadia. Caucasian woman in her 50's. Near 6am. I guess Arcadia has their own version of our DIRTS? Political signs can be on the parkway strip as that is controlled by the owner of the adjacent property BUT with the permission of the adjacent property owner. If you know the property is vacant you can bet it was put there by a realtor who has/has had the listing. I can think of several who might do this. Also, if you know it was put there without the permission of the owner, take it down and lie if flat--don't remove it. In the past one landscapper went to all his customers in town and asked if he could put up signs for the candidate he supported and of course since he was such a nice guy the customers said yes. That way they got gobs of signs up for Buchannan. It has ever been so in Sierra Madre. The prom committee is is bunch of louts. Defeat this UUT. If you know people at the homes to the left and right and across the street of the Yes signs, make copies of the Tattler and give it to them. Concentrate your effort. Ask them if they want a NO sign. Spread the word. Not everyone gets this message from the Tattler. great post - I know a person who has a yes sign and those around have nothing. YES on the highest tax rates in California - that's what a YES vote gets you. We are getting reports of signs being stolen. Please report anything you might have seen here on the blog. That explains what happened to Earl Richey's sign. Just a little in-sight. People who are yes on the UUT are people who are on that kind of pension / pay system. Examples would be teachers, policemen and other government affiliated jobs. These are the people selling their friends and family on the Yes on the UUT. Make no doubt about it, the yes voters are influenced by the recipients and not the true facts. Unfortunately this is how the system works and thus is the reason to be an educated voter. Because it's time for the voters to win one, I'm voting NO on the UUT. I have a queasy feeling about this election. Many, many untruths floating around to discredit a couple of the candidates plus Green signs going up replacing other candidate's signs. If Green gets in it won't be because of his great qualifications or platform. Just sayn'. Green is all signs, no voters. He will not win. He is the town joke. Green is Noah Pants. Voters only want clothed candidates. You miscalculate the Mosca/Moran/Goss/Green machine. We all thought MaryAnn would win, but the same lies about her are circulating about the women candidates now. Last time they lied up a storm and 2 out of their three candidates lost, and the UUT went down in flames. Honestly, having those nuts running around town badmouthing decent people is not a bad thing. The whole Moran-Mosca-Walsh thing is just a bad joke now. MaryAnn lost because Johnny flooded the market with out of town cash. He bought his seat. And here I thought they were supposed to be civil. There are rumors of a doomsday set of Noah pics. Yes, I've heard that. I also hear they will be published this weekend in the Mountain Views News. True? Say it ain't so Noah, say it aint' so! On a serious note, Noah remians my favorite candidate. Are we really going to elect boring, old Gene the JC professor instead of Noah the performance artist? Think of the entertainment we will be missing out on. We have had 4 years of performance artists Nancy Walsh and Josh Moran. Not to mention Runaway Joe. I have had it with clowns. I will only settle for competence. That leaves both Goss and Noah Brains out. Noah is like a carnival barker. It's painful listening to him. Do you know what the column headers mean? From Lump Sum to Deferred Comp. $3000 a month for benefits? Seems excessive! $5 copay probably for the whole family. It seems we have nobles in local government--maybe we'll get free cake at the 4th of July Parade! Free trips to the guillotine for townies! No cake. Staff and SMPD will be too busy performing the public service of arresting dad's who squirt water guns like back in the old days when the parade was fun. Staff and SMPD are overpaid by us to torment us. Let's make sure we raise our taxes so they can keep it up! Why is it people have forgotten the wave of home invasion robberies that hit this city several months ago? We keep hearing that this is a low crime city. Did anyone ask the people who were hit? OK, I've been asked. The dopes at smpd came to the house and indicated we should have locked down the house. That was the sum and substance of their police work. Now, I don't blame them for our loss. There was nothing they could do about it. Which is precisely the point: smpd's overpriced and overweight presence has zero impact on crime. So, when asked to raise our aleady high taxes so that we ca throw $1.5 million a year down the drain so that we caan have smpd painted on the cars, this burglary victim says "no." "Mountain Views News endorses Gene Goss, Noah Green and Rachelle Arizmendi for Sierra Madre City Council! "These three candidates have demonstrated a willingness to represent the entire city and work as part of a team that will always put the best interests of Sierra Madre first!!" Susan Henderson, Publisher and Editor"